The University of Virginia Health System wanted to create interactive multimedia reports, believing that radiologists could communicate better through the use of enriched and interactive content. The radiology report is the principle work product of the radiologist. Until recently, reports describing findings in imaging studies have been plain, text-only documents. Such reports are increasingly inadequate. 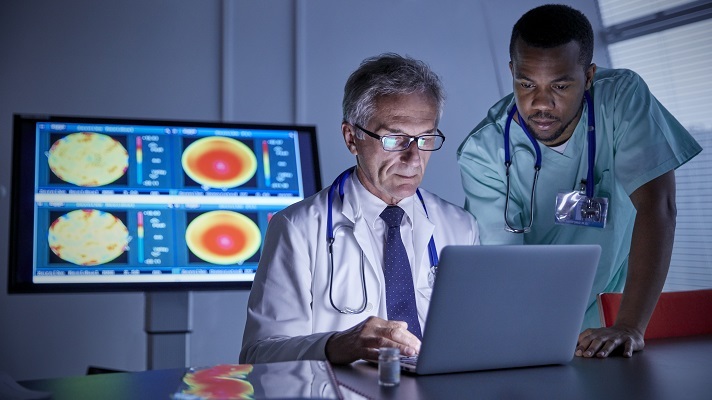 Because radiology reporting applications typically are separate from the applications used to view images, radiologists are hindered in their ability to create interactive reports that connect directly to imaging findings, he added. The University of Virginia Health System wanted to create AI-powered, interactive multimedia reports, believing that radiologists could communicate better through the use of enriched and interactive content. The University of Virginia Health System implemented interactive multimedia reporting via a hybridized viewing-reporting application. More specifically, it used AI-driven Vue Reporting embedded in Vue PACS by vendor Carestream Health. There are many imaging and PACS technology vendors serving the healthcare marketplace. These vendors include AGFA Healthcare, Apollo Enterprise Imaging, GE Healthcare, Canon USA, Dicom Systems, FUJIFILM Medical Systems USA, Hyland Healthcare, Konica Minolta, Lumedx, Philips, Sectra, Siemens Healthineers and Singular Medical Technologies. Radiologists now view and report images from the same application, so it’s easier to create interactive multimedia reports. The technology is used by radiologists – residents, fellows and faculty. They all needed to learn to report from a new application and adopt new multimedia reporting habits. One reports a little differently when adding rich content rather than just plain-text. This saves them time in results review and improves the clarity of reports, he added. It can be easier to digest AI-refined complex information visually than to read lengthy descriptions, he said. And patients will be more engaged by seeing images in their reports, he added. "The use of formatted text allows us to make statements stand out in bold, underline or color for emphasis. It’s only natural for your eyes to be drawn to styled text against a background of plain black text." The University of Virginia Health System uses the Epic electronic health record. To date, staff has been able to place interactive multimedia reports in the EHR in the form of PDFs. They also have links in the EHR that launch an image and multimedia report viewer – Vue Motion from Carestream Health. The University of Virginia Health System has had technical success in creating AI-powered, interactive multimedia reports and making them visible to referring providers and patients. It has examined the frequency that reports contain hyperlinks to imaging findings in the PACS. The University of Virginia Health System is interested in tracking how often patients and referring providers click on the interactive content within reports, but staff is just beginning to look at this. “We know anecdotally that our radiologists commonly find convenience in clicking the links in previous reports when comparing to previous studies, but we have not yet quantified this impact,” he said. It is a departure from conventional reporting practice, so it helps to have radiologists onboard with the decision to implement such technology on the front end, he added. However, if radiologists are not onboard, one can implement the technology and they may come to use it over time. Creating interactive multimedia reports is not the same as disseminating them, he added. Organizations will need to consider integration of advanced reports into their existing or future information systems, he advised. One needs a mechanism to share the interactive multimedia content, he said. The University of Virginia Health System technology worked for them, he said, but the technology is continuing to improve. Dr. Gaskin will be speaking on the subject of AI at HIMSS19 in a session titled “Enhancing Care with AI-Driven Interactive Multimedia Reports.” It's scheduled for Tuesday, February 12, from 10:30-11:30 a.m. in room W311E.